I was quite sad to learn George Clayton Johnson passed on Christmas day at 86 years old. He was the force behind the best that SciFi was about in the 20th century. He wrote some of the best stories ever conceived. Writing is what makes SciFi so amazing – not the SFX. He wrote “The Man Trap” episode of the original Star Trek. He wrote some of the best episodes of The Twilight Zone. He co-wrote one of my favorite SciFi books of all time. Pretty good success for being born in a barn. I will never forget the impact on my mind by the book Logan’s Run. I had read a lot of SciFi before reading that book. But going from “The Green Ghost” by Alfred Hitchcock and other books in his series of books intended for young readers to something like Logan’s Run was quite a jump to make. At least it wasn’t as graphic as Robert Silverberg’s “The World Inside” which I found and read in my middle school library in the 8th grade! I was a very young teen when I read Logan’s Run. 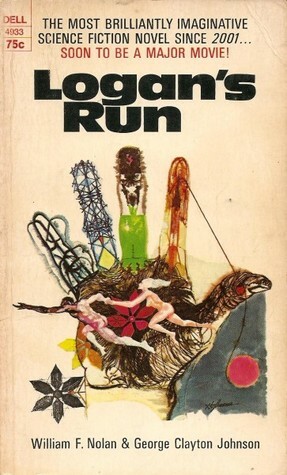 I still have and cherish the very copy of Logan’s Run I read. I wouldn’t suggest that novel to young teens, but since Johnson wrote the first episode of the original Star Trek television series, I had to read it. It certainly wasn’t intended for YA readers. When the SciFi novel Logan’s Run came out, YA hadn’t been invented yet. Young SciFi readers such as myself had to contend with certain concepts before we really wanted to. However, the premise of the book captured my mind. This talented writer did quite well for himself considering he was born in a barn in Wyoming and dropped out of school after the eighth grade. He became a hit after writing an episode of the Alfred Hitchcock Presents program in 1959. Wow – I had no idea who Geo Clayton Johnson was…I’ll have to read Logan’s Run sometime…Thanks for sharing, Tony! Been thinking about you and your family over the holidays..hope all is well ! Would love to meet over dinner sometime..
Been working with a Tennessee State House Representative on some upcoming Tennessee history films. A good possibility for a television production also. He is friends with Bill Ford of the USS Tirante. The Theatrical edit of the Submariner feature is ready for release – it went to last year’s GI Film Festival in Washington DC and got many accolades. In fact – we will be doing a private showing for some possible Executive Producers soon. Hope you can attend.